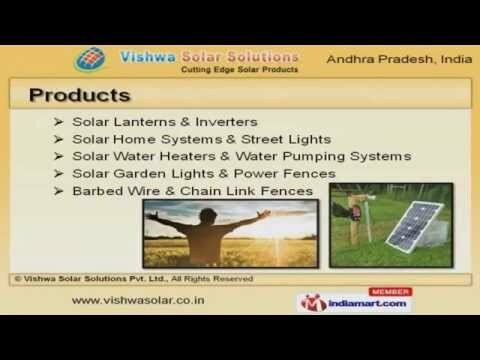 Welcome to Vishwa Solar Solutions, Manufacturer and Supplier of Solar Products. The company was established in 2013, at Hyderabad. Sound financial position and TQM has helped us to earn clients across the globe. Prompt & safe deliveries of consignments help us to cater Ganga Refrigerators Works. We offer a splendid range of Solar Lanterns, Garden Lights and Power Fences. Solar Lanterns and Inverters offered by us are best in the industry amongst others. We are known in the industry as the manufacturer of Solar Home Systems and Street Lights. Our clients can avail from us an exquisite range of Solar Water Heaters and Water Pumping Systems. Along with that we offer Solar Garden Lights and Power Fences that are extremely reliable. We also provide Barbed Wire and Chain Link Fences that are a class apart.